Designed to enhance any working environment, the Ensign is an example of practicality, convenience, and functional design. Tabletop height and angle are spring-action controlled. Simultaneous adjustments are made using the extendable-length brake lever conveniently located on the right side. Angle adjustment from 0° to 90° with an adjustable height of 35" to 47". Features a double-pedestal base design of heavy-gauge steel with rounded profile for superior stability. 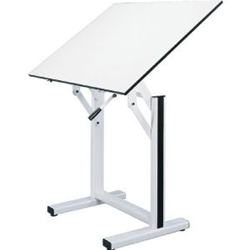 Warp-free white Melamine® tabletop. Base comes in white or black finish. WARNING: This product contains Formaldehyde, known to the State of California to cause cancer. For more information, go to - www.P65Warnings.ca.gov. *OVERSIZED ITEM. SHIPPED BY TRUCK ONLY! UPS RATES DO NOT APPLY. PLEASE CONTACT US PRIOR TO ORDERING FOR A FREIGHT QUOTE TO YOUR AREA!